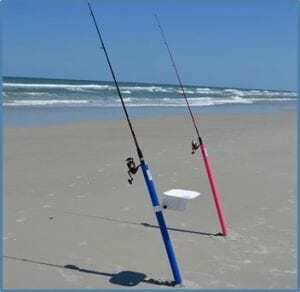 A surf fishing rod is a great tool for catching all your favorite fish while standing on the shoreline or wading in the surf. But surf fishing is very demanding, on both the angler and the tackle. When it comes to surf fishing, you need certain types of equipment to get the job done. You can’t just settle for the rod and reel that you use when fishing from a pier or bridge. 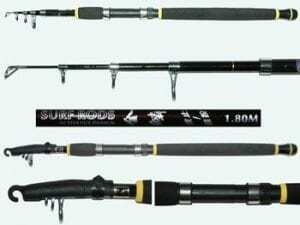 You need stronger, more specialized gear like surf fishing rods (Source). 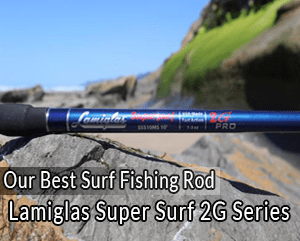 A good surf fishing rod should have decent strength and power since it deals with heavyweights, bait, and the constant onslaught of sand and water. Durability is very important but it shouldn’t come at the cost of lightness and responsiveness. Since finding the right rod can be difficult, here’s a list of the top 5 rods on the market and how to choose the right one for you. For the past 65 years, Lamiglas has produced some of the finest high-end, American-made fishing rods on the market. Despite their huge success, they still prefer to go old-school, making hand-built gear out of a small factory in Washington. This impressive rod, in particular, is one of the finest models by Lamiglas. It feels so light in your hands, yet it can easily fling weights up to 6 ounces across 100 yards. A 50-pound fish doesn’t stand a chance against this rod. The Lamiglas might be a bit expensive, but its versatility definitely justifies the price. You won’t have to buy several rods because its graphite build gives you enough stiffness and responsive action for all kinds of situations. If you’re looking for great looks, excellent quality, and impressive distance casting power, then look no further. The Lamiglas has everything you’ll ever need. This company has been building high-tech fishing rods for years. It’s a market leader when it comes to surf fishing rods. The St. Croix Mojo Surf Casting Rod definitely lives up to the company name. The St. Croix is one of the most technologically advanced fishing rods in the world. 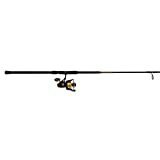 It comes with Poly Curve technology which eliminates transitional points and dead spots in the rod blank. This means you’ll get better action, strength and sensitivity. As for the Advanced Reinforcing Technology, it incorporates exotic carbon fibers in order to increase strength by up to 10 times! But get this: this boost in strength doesn’t come with an increase in diameter or weight. Pretty unique! The zirconium rings are a great addition that allows for more distance and accuracy. As for the reel seat and screw clamps, they offer tight reel placement and a solid base for when you go up against big fish. Here’s another great rod by St. Croix, but this one’s a specialty surf spinning rod. If you plan on going to Hawaii or Costa Rica, this fishing rod is definitely the right choice. It’s a durable, multi-piece rod that’ll serve all your fishing needs. Just like the other St. Croix fishing rod, this one comes with Advanced Reinforcing Technology. The exotic carbon fibers provide enough strength and durability to make this multi-piece rod one of a kind. Don’t be worried about the fact that this rod breaks down into 4 pieces. It’s actually what makes it so easy to manage and move. Plus, it comes with a nylon covered rod case to keep your precious fishing rod safe during travels. To make things even better, this premium-quality surf fishing rod comes with a 5-year warranty. You won’t have to worry about anything happening to this rod because it’ll definitely last for decades. Sometimes you just want to get a surf fishing rod for the heck of it, right? You could use it for a good time with the kids, as a spare, or just to try out surf fishing for once. If that’s what you need, you don’t have to search extensively. The Penn Spinfisher is a great, simple surf fishing rod that comes at an even better price. It offers decent action and strength along with several handy features. If you’re fishing with weights that are more than 4-5 ounces, it might not be the best choice for you. It can throw pretty far, but heavier weights tend to put some strain on the drag, although it can often be managed. 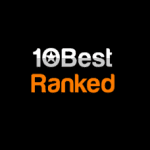 Okuma is one of the top performance fishing gear companies around the world. Quality is their top priority, although it doesn’t come at a hefty price. This rod is an example of great power and precision, all at an affordable price. The tip of the Okuma Solaris has just enough feel for you sense even the slightest bumps of the bait. At the same time, it maintains decent enough strength to stay put while the rod loads up on the cast. For extended fights, the EVA foam padding around the reel seats gives you extra protection. As for the reel seats, they provide you with enough strength to hold big saltwater spinning reels in place. They’re as firm as it gets. This is a great surf fishing rod for the budget-conscious fisherman. It can easily fling a 5-ounce lure across 100 yards. Balance this rod with the right reel and you’ll be fishing with a rod that’s worth a lot more than its price. When surf fishing, you usually want to cast your bait or lure past the breaking waves. That’s where most of the fish are. Not to mention water past this point is calmer and easier to work with. With that in mind, you’ll need an impressive casting distance, right? You need a fishing rod that can go past these breaking waves and at the same time, maintain your accuracy, to an extent. When it comes to casting distance, there are two things you should consider: rod length and rod action. If we were to ignore all other factors and just focus on rod length, you’ll find that longer poles give you better casting distance. That’s probably the reason you’ll find most surf fishing rods to be around 9 to 14 feet long. The only downside to a long rod is that shorter ones give you more control and accuracy, being easier to use. When it comes to rod action, rods with slower actions tend to improve your casting range. Why? Simply, because slow action rods bend farther than those with fast actions. Keep in mind that the slower your rod is, the more help it’ll offer you. However, you’ll find that fishing rods of slower action can reduce your accuracy somewhat. Everything’s a tradeoff. Rod length, rod action, and accuracy, you have to compromise. This one’s pretty obvious. You can’t expect a 2-pound jack and a 400-pound blacktip to require the same gear, right? Think about the fish you’re going after, before choosing you surf fishing rod. If you don’t want to waste your time thinking about it, just get a decent all-around fishing rod. But keep in mind, the more specific you can get with your target, the better the results you’ll be guaranteed. As a general rule, if you’re going after larger fish, then choose heavier powers and longer lengths. This’ll help you set the hook more quickly and efficiently. Keep in mind that longer fishing rods are tiring, especially for smaller people. If you’re not specifically going after large fish, then settle for a slightly shorter and lighter rod. The third factor you should consider when buying a surf fishing rod is the bait or lure you’re going to use. More specifically, the weight of your lure or bait is what matters. If you’re going to use lightweight plugs or small spoons, then you’ll need a lightweight rod with a fast or extra-fast action. On the other hand, if you’re using a 4-ounce hunk of lead along with 6-inch baitfish, then you’ll need a different kind of rod. It’ll have to offer slower action and much heavier power. Think about your bait and lure before choosing your rod. Finding the right surf fishing rod for you isn’t easy. It takes a lot of thought and consideration. Think about your circumstances and preferences, they’re ultimately what matters. Try one out today and see for yourself what surf fishing is all about.